Salvation And Survival: The Real Power Behind "David's Sling"
The Real Power Behind "David's Sling"
No matter which side the international community falls regarding the U.S./Iran "deal" on nuclear weapons, all can agree that Israel has a huge stake in the outcome. It's always interesting to peruse the different media sites to try and determine how the "official spin" is being perceived. U.S. media outlets seem hesitant to declare it a victory for the U.S. (or the world), as all signs point to further stalling by Iran and continued development of their nuclear capabilities. Furthermore, the U.S. seems to be more concerned with protecting Iran's "right" to nuclear expansion, than to the concerns of our ally, Israel, over overt Iranian threats to their homeland. Russia Today, (RT), a global multilingual television news network based in Moscow and funded by the Russian government, asserts that the recent testing of Israel's anti-ballistic missile system, called "David's Sling" is in reaction to the latest in the Iran nuclear talks. This short-range ballistic missile defense system is designed to intercept medium range missiles from nearby Gaza, Syria, and Lebanon, home of the Shi'a Islamist militant group and political party, Hezbollah -- who, have sworn to annihilate Israel, and not surprisingly, hailed the news that Iran is closer to securing a nuclear bomb. 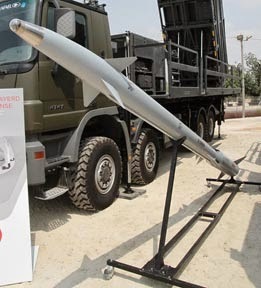 Keeping in line with that sentiment, The Daily Star, a news outlet in Lebanon, declared that the preliminary success of "David's Sling" would not protect Israel "from the threat posed by Hezbollah’s ever-expanding and varied arsenal of missiles and rockets." In fact, The Daily Star wrote that an assessment by the Israeli army released within the last week predicts that Israel could be hit by as many as 1,500 rockets a day in the next war, leaving hundreds dead and requiring mass evacuations. They also predicted that "the success rate of Israel's 'Iron Dome' and 'David’s Sling' in knocking out Hezbollah’s rockets is largely irrelevant." The substance of the article states that Hezbollah, and Israel's enemies, should have no problem evading "David's Sling." Perhaps all those who are willing to discount Israel's latest defense system should do a little historical research. I'm sure you realize that it is no coincidence that Israel chose to name its anti-ballistic missile system after the choice of weapon of their legendary Shepherd King, David. Israel's ancient enemy, the Philistines, also mocked the effectiveness of the original David's sling. But those who oppose Israel in modern times should take heed of the outcome of the battle between the slight, young, boy and the giant named Goliath. Interestingly enough, RT refers to Israel's latest anti-ballistic missile system as "unique, small, and agile", a description that could as easily be applied to David, as he engaged in his epic battle. 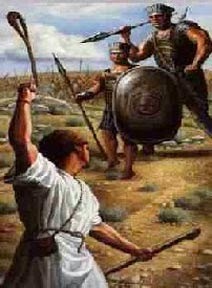 Just as today, there seemed to be a huge discrepancy in the weapons the enemy combatants chose; and it looked as if David's sling was no match for the 9 foot giant, Goliath, whose protective armor weighed over 150 pounds, and who carried a spear that measured 26 feet! But as those watching the ancient battle soon concluded, it was a mistake to underestimate David's sling or the power behind it. First of all, David's sling was a formidable weapon. It has been argued by experts in ancient warfare that a good slinger hurled a stone as far and accurately as a good archer. One Roman writer noted that opponents in leather armor were in far greater danger from sling missiles than arrows. Even if the stone did not penetrate the armor, it was capable of inflicting a fatal internal injury. Now consider that David, the shepherd boy, had ample practice slinging his stones at wolves, lions, and bears who attempted to attack his sheep. He boasts to King Saul that he has killed any threat to his herd by this simple method. Then consider that David probably wound up his sling with a circular arm motion, slinging around probably at six or seven revolutions per second. Experts on ballistics have speculated that the stopping power of the rock fired from David's sling was roughly equal to the stopping power of a [.45 caliber] handgun. It was an incredibly devastating weapon when applied to the center of Goliath's forehead! Of course, you realize that the real power behind David and his sling was the God of Israel. David, representing the nation of Israel, declared that, with his sling, he would be delivered out of the hand of his enemies. He prophesied that all would see that the battle was the Lord's, and that he, David, was supported by the hosts of heaven. If I was going to pick a name for a weapons system to protect Israel, none could be found more appropriate than "David's Sling". Remember last summer's rocket attacks from the Palestinian militants, Hamas, against Israel? Do you remember the miraculous interventions and divine miracles attributed to the Iron Dome defense system? I think we can expect more such miracles for Israel, as God defends her from those who wish to destroy her. Psalm 27:3 Of David ... Though an army encamp against me, my heart shall not fear; though war arise against me, yet I will be confident. Thanks for the encouraging words in these difficult times. It's appreciated!